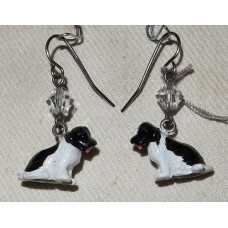 Handpainted earrings in pewter with a Newfoundland Sitting painted black and white with pink tounge. These earrings are decorated with crystal beads from Swarovski in the color Crystal. This pair of earring is for pierced ears and it has French hooks in surgical stainless steel. The length of the earring is approx. 25 mm and the width is 15 mm.